I found some really nice info on boattest.com about the relationship MPG vs RPM. According to their test, the peak performance is reached at 5000 rpm or 27 mph and the consumption is then 4.62 mpg. Here's their chart, or you can find the whole table in the document attached. The complete test data can be found at: http://www.boattest.com/boats/Sea-Doo/tested_brand.aspx . Most Seadoo jetboats have also been tested. Cool site! I saw that too. Thanks for posting it. 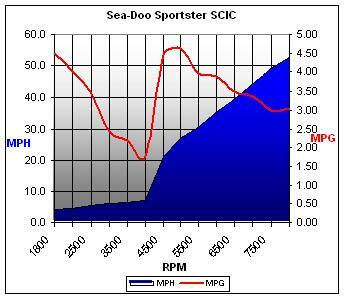 My sportster will hold plane at 4700 rpm about 20-22 mph but below 4700 rpm the boat falls off plane. Maybe I don't understand how to read that chart but at 4700 RPM the fuel consumption is sky rocketing and it make is read like the best fuel economy is just prior to planing which doesn't make sense to me. Maybe my wear ring is slipping and I have to spin faster to get on plan. When do other sportster SCIC boat owners boats plane? Actually, the higher the red line goes, the better. This is the MPG, the number of miles you can get out a single gallon of gas. So, 4,700 is actually the most "efficient" RPM. So the lesson from all this is, if (like me the other day) your stupid fuel gauge screws up and you end up running on fumes, your best chances to make it to the fuel pump is to throttle up to 2200rpm and pray. A better lesson is not to trust the gauge and regularly stick your head upside down the engine bay to check on your tank level directly . Duh! Thanks. MPG was staring me in the face but I was reading GPH instead! Really you'd putt along at 2200 RPM if you were dangerously low on fuel? 4750-5000 RPM is the same consumption (per distance) and you'll know you're fate much sooner! You are absolutely correct. I meant to write 22mph, not 2200rpm (stayed up way too late last night...). I guess we all got our wires crossed on this post! Yes, 4750-5000 rpm is definitely the best performance. Thanks for the correction!